Durban – Olympic star Michèle Eray will start this weekend’s Dunlop Surf Ski World Cup Durban as the overwhelming favourite to win the women’s title, and in the process continue the staggering unbeaten run in domestic and international surf ski races.Eray, who hails from Plettenberg Bay but is currently based in Durban where she is competing in the winter Discovery Men’s Health Surf Ski Series, won the tough Investec Surf Ski World Cup in Mauritius held in difficult big surf conditions off the Indian Ocean Island, racing away from Toti stalwart Michelle Eder in the dying stages of the race. 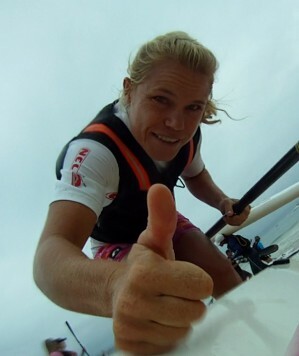 After a thoroughly successful Beijing Olympic Games where she stroked the South African women’s K4 into the A final, Eray has turned her attention to the discipline of surf ski racing that she loves, and has proved to be unbeatable. Eray hit global headlines by winning the lucrative Dubai Shamaal in November last year, starting her unbeaten streak that has taken in a number of tough internationals, and all of the domestic series races she has entered. Apparently carefree in her attitude, the likeable Eastern Cape star is a fiercely determined competitor who often measures her performance against male competitors, while campaigning for improved recognition for elite women’s achievements.“It looks like I will be starting in B Grade and it will be an added incentive if I can win that category as well,” said Eray. Eray is likely to find her toughest competition coming from the core of elite local surf ski paddlers, including the Amanzimtoti duo of Tiffany Kruger and Michelle Eder, Donna Winter, Nathalie Veckranges and Angelique Mulder, as the defending champion Alexa Cole has not been racing competitively this season. Should the weather be coming from the south, the race will repeat last year’s course from uShaka beach in Durban to Westbrook beach outside Tongaat, a distance of 32km. However should the prevailing weather be coming from the north east, then the race will start at Ushaka beach and finish at Winklespruit, 35km in distance. Should the World Cup be raced on the Saturday, then a social mixed doubles race will be held from DUC on the Sunday where organisers are encouraging the serious racers to paddle with their spouses, as a thank you for their support. Durban – Surf ski paddlers will be anxiously watching the ocean and hi-tech weather forecasting models to see if the anticipated weather front arrives on the weekend for the Dunlop Surf Ski World Cup Durban 2009. With a powerful field of the world’s best surf ski racers assembled for the 35km downwind race, the organisers have stuck to their guns and will wait for the arrival of the frontal system on Sunday to be able to offer the optimal swell and sea conditions for this premier event. With McGregor absent, away in the Western Cape to defend his title in the Berg River Canoe Marathon, the door has been left open to crown a new champion, leaving the classy field of elite surf ski racers decidedly on edge ahead of the race. Durban surf iron man Matt Bouman has enjoyed prodigious success in the domestic Discovery Men’s Health Surf Ski Series this winter where he is unbeaten, albeit in generally mild ocean conditions, and will start the race as one of the serious contenders to lift the title, and the winners cheque of R40 000. Pretorius narrowly lost the Investec Mauritius Ocean Challenge title to Hank McGregor in big swells on the weekend, and is due another big international result after his sensational victory in the 2006 Molokai Challenge. Race boss Billy Harker told a gathering of sponsors, media and elite paddlers that he was planning to start the race at the Durban Underwater Club at Ushaka Beach at midday on Sunday, as the weekends balmy windless weather will give way to the arrival of a South Westerly front mid morning on Sunday. That will pave the way for a repeat of last years 32km course from Durban to Westbrook beach outside Tongaat, though the winds and swell will be less severe that those experienced last year when Hank McGregor raced away in three and a half metre swells to claim the title. However the race organising committee are still open to changing the venue – and the day – of the race to take advantage of moderate Easterly winds on Saturday that will offer a race from Durban to Winklespruit. The final decision will be relayed to all participants by SMS and at the pre-race briefing. Another elite icon Dawid Mocke from the Western Cape agrees, and was quick to debunk Pretorius’ apparently lackadaisical approach, pointing out that the Durban North youngster had come storming through the field to claim second in last years Durban Surf Ski World Cup, and then repeated his come-from-behind charges in the Hong Kong Dragon Run, the Dubai Shamaal and last weekend’s international in Mauritius. “Watch your back!” was his clear message. “There is a very clear strategy to (Pretorius’) race, and it is working well for him at the moment,” said Mocke. 2007 winner and current surfski.info world series champion Oscar Chalupsky stressed that the extent to which the arrival of the weather whips up the swell would profoundly determine the outcome of the race and the likely title contenders. He also looked to the largely unheralded international contingent to perform, particularly if the conditions are not as big as last year. Mark Anderson will fly the flag for Australia, and will race for a place in the prizemoney with Frenchman Yannick Laousse. His Brittany compatriots Gaetan Sene and Martin Gunda and have both been forced to withdraw due to injuries suffered in the build-up to the race. The women’s race sees Australian Lara Taylor eager to mix it with the classy field of locals headed up by the apparently invincible Michèle Eray, and the likes of Tiffany Kruger, Danica Vorster, Michelle Eder, Nathalie Veckranges and Donna Winter. Eray was in superb form winning in Mauritius, a title that will sit alongside her trophies from the Dubai Shamaal, Hong Kong Dragon Run, Eurochallenge, the Cape Point Challenge, the SA Single Ski Champs and the 2009 Drak Challenge canoe marathon. The sprightly twenty-something Plettenberg Bay star who stroked the SA women’s K4 to the A final in the Beijing Olympic Games last year has had the measure of all her challengers in the past year, and hasn’t tasted defeat in a ski race in that time. The event will provide a great opportunity for ski enthusiasts to follow the race live on a big screen at the Durban Underwater Club on Sunday afternoon, as fifty boats will be fitted with GPS tracking devices, allowing for real time monitoring of the positions of every contenders in each of the categories. With over R120 000 in prizemoney spread between the various classes and age groups in single and double skis, the three star event on the surfski.info world series remains one of the most prestigious titles on the global calendar. Georg Schramm, Head Sales and Marketing at Dunlop Tyres. “This race represents a lifestyle that and a search for excellence that we can identify with.